Tract tracing techniques provide tools for the study of the termination or origin of central neural pathways or peripheral nerves. The understanding of the organization of neural circuits has represented one of the major goals in neuroscience since its birth. In the second half of the 19th century, the pioneers in tract tracing discovered that retrograde degeneration of neuronal cell bodies and anterograde degeneration of fibers could be used to trace pathways in the nervous system. Thus, “the earliest way to identify the neurons sending their axons to a given neural structure was to destroy the structure” (20). 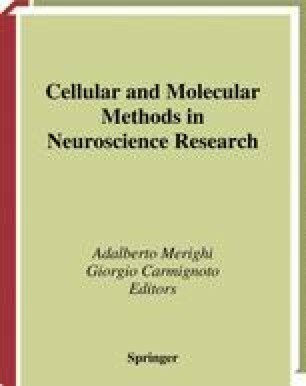 In addition, the Golgi method, which impregnates random subsets of neuronal cell bodies and processes in their entirety, played a crucial role not only in unraveling the basic structure of the nervous system, but also in pioneering investigations on its connectivity. Cajal’s seminal studies on the wiring of the nervous system were in fact based on Golgi-impregnated material (5). It is very hard, however, to effectively impregnate the axons and to reconstruct their trajectory over long distances with the Golgi staining. This techconnections, i.e., at a limited distance from the cell body.